I snuck out on two hikes this weekend, both at my favorite oasis of Ohiopyle, PA. On Saturday, I woke up a little after 5AM and tried to make my arrival close to sunrise, this way I could get back in time when the rest of my family is stirring and I wouldn’t miss out on too much. A couple weeks back I was hiking on a trail (the same hike where Benny found a deer’s leg), a fellow hiker had his dog off leash. The dog sprinted away from his owner and charged me at full steam, the owner shouted and was obviously concerned, but there was no catching that dog, he was determined to get me. Fortunately, it was very cold outside and I had jeans on with heavy socks underneath, the dog bit at my pants and issued me minor cuts on both legs. The dog was 40 or 50 lbs, not huge, but it was big enough to cause concern. Benny was bewildered by the whole scene and chose to watch on the sidelines. As the dog was biting my jeans, I thought about grabbing his collar, but figured he would then just bite my arm, which is something I did not want. At this point, my next option was to just start punching the dog’s head, I was about to deliver a haymaker when the dog’s owner finally grabbed the animal by the collar and pulled him away. The reason I tell you about this wild scene as it planted a seed in my mind that was not there previously. What the heck are you going to do if you are attacked by an animal on these hikes? Simultaneously, I have recently taken interest in a summer solstice hike that happens in June where you have from sunrise to sunset to hike 34 miles. A friend who plans on participating advised that I should acquire trekking poles for the long hike. 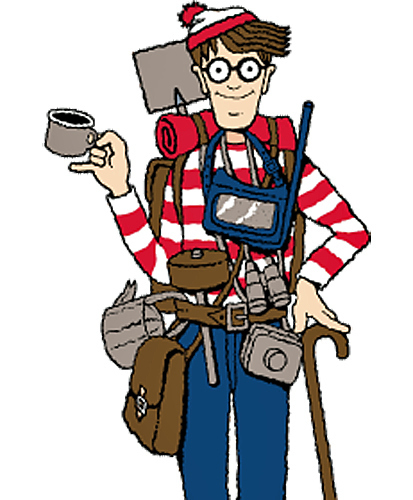 I dismissed trekking poles as nerdy and said I did not want to be a dork on a trail, I might as well throw on a striped shirt and hat and finalize my complete transformation to Waldo. Anyways, after doing some research, it seems like trekking poles do in fact help improve hiking distance by achieving greater weight distribution. The trekking poles aren’t necessary on most hikes that are shorter in duration, but could be used to beat a dog away. Therefore, I will acquire trekking poles to solve my concern about getting attacked by an animal and to enhance my hiking distance. After my hike, I wanted to treat my family to a big fun afternoon because I’ve been working too much lately. We all went down to Dave & Busters and played games for a couple hours. Each family member had their moment when they accomplished an amazing feat and won gazillions of tickets, we had a serious ticket rush. Here we are determining which products would most optimize our tickets. On Sunday morning, I woke up around 6AM and got in another hike in Ohiopyle. It was chilly in the mornings, but ice was melting by 9AM. Benny is the only creature capable of appreciating these hikes more than I.
I hiked up to Baughman Rock (picture above), it is about 2.3 miles from the town of Ohiopyle, mostly at a steep incline. It was about 22 degrees during this hike, so my lungs were burning for a good portion of it. Benny at Baughman Rock, on the other side of the fence is a steep cliff. You can see he approached it with caution. He is standing where I took the above selfie. Encouraged to see the trees are starting to bud. The next two snap shots are from my hiking app, Gaia GPS. It works without cell phone reception by downloading the map prior to your hike, saving it on your phone. Then when hiking in areas without service, turn your phone onto airplane mode and it tracks your position on the saved map. The black line is the hike I took on Saturday. The image below is a sample of the stats it tracks, including altitude and speed. The night included a carriage ride, the next picture is a carriage ride selfie. Dalia and I attended a Daddy Daughter Dance at the Children’s Museum in Pittsburgh last night. With a high degree of confidence I can say that Dalia had one of the best nights of her life. She had picked out a special dress, carried her special purse (from Claire’s) that contained a Japanese fan in the event she needed to cool herself off from dancing too much, her mom’s old iPhone that she now carries proudly (she proactively announced to several strangers that she has her own iPhone), and gum. Mom helped with the lipstick, but Dalia did her makeup. I really do not like wearing ties, but decided to go all out for the occasion. From the moment we got there, Dalia wanted to dance and dance and dance. An unknown muscle between my ankles and calf muscle is sore on both legs from all the dancing. I am not sure where Dalia learned to dance, but she was a jumping bean mixing in lots of exciting dance maneuvers, she was constantly smiling. Benny and I went on a hike this weekend, Benny found this deer leg and carried it proudly for about a mile. I could tell he wanted to go off under a tree and chew on it for awhile, but it was not in the cards. He reluctantly put it back in the woods and I know he will often think about the leg that got away. Jekoro – Ajoyo (I call Jaclyn, Jacalope – Jaclyn and I sing this song together, but sing “JACALOPE!” every time the Jekoro is said on the song, you would love it. Saw this in Sunday’s newspaper, thought it was a very sweet gesture by Sam. You threw the bums a dime in your prime, didn’t you ? Last week I worked a bunch of 12 hour days and now things seem to be back to normal, as I get older, my appreciation for work/life balance increases. Jaclyn gave me a lovely card and delicious Pittsburgh chocolate covered pretzels from Sarris Candies (my favorite). Dalia decorated the house with lovely cards shaped like hearts that she cut from scrap paper with sweet messages to all of us. Jaclyn vetoed a proposed hike that Benny and I were going to take because the temperatures were below zero. On Saturday night I saw all my friends from back home, they were in Pittsburgh for a big birthday party, I really love seeing the gang and having friends who have essentially stayed the same since elementary school. Today in Pittsburgh it will snow, then rain, then freeze. Hope that ground hog was right and spring comes early. The weird guy in the background is Allen Ginsberg, who wrote the famous poem titled Howl (http://www.poetryfoundation.org/poem/179381 ). I loved all that beat generation stuff in college (Kerouac and to a much lesser extent Bukowski). At the end of Howl, Allen Ginsberg goes on to say “Moloch! Moloch! Robot apartments! invisible suburbs! skeleton treasuries! blind capitals! demonic industries! spectral nations! invincible madhouses! monstrous bombs!” Good lord that poem resonated with me, Allen Ginsberg and I hated THE MAN who keeps us down – aka Moloch who suppresses individuality, the machinery of capitalism and imperialism. Late in college, I worked at the Doylestown bookstore and they allowed me to borrow all their books as long as I returned them in relatively good shape. I read a ton there, but fell in love with Ernest Hemingway’s pursuit of adventure and honest way of writing. Ayn Rand provided a robust counterpoint to Ginsberg with The Fountainhead and Atlas Shrugged. One time I stopped in Woodstock, NY – I had places to be and it just happened to be on the way, but I barely had time to stop, but I needed to see it, so I parked the car, hopped out in my shirt & tie and started walking down the sidewalk. A man that resembled Allen Ginsberg who wore a very weird cloak and had a large walking stick with bells on the end of it noticed me. He started to run towards me, shaking his stick so the bells jingled like crazy, I swear he was calling me Moloch. He hastened my brief stop and contemplated its meaning for awhile. If I see that man again, it would no longer bother me. Happy Birthday Abe Lincoln, glad you kept the union together. Liked the way the sky was looking on Friday night. On Saturday, we headed to Slippery Rock Gorge Trail. On one end, it leads to Hell’s Hollow, on the other side, you go up a very steep mountain, travel along a ridge, and the descend back to the creek to a portion known as Walnut Flats. We had unseasonably warm temperatures for February, the kids did the 4.4 mile hike with 1,300 feet in elevation changes without much issue. Rosie gave up three quarters of the way through, Benny wasn’t challenged enough and ran far ahead, then flanked us on the high ground and would surprise us by flying onto the trail from up above us, he enjoyed it in equal proportion to the amount is scared the hell out of us. We started at Eckert Bridge, which is now closed, so we have to park at a place called Breakneck Bridge in Portersville, PA. The snow melt contributed to a swollen Slippery Rock Creek, but it was still perfectly clear in some spots, just pristine water. These were neat ice formations that resembled mushrooms. Here is Benny running ahead, trying to identify his next opportunity to scare us. If you look closely, you can spot Rosie dressed in her little sweater. Speaking of Rosie, we lost her tonight and could not find her anywhere in or around the house. We went running around the neighborhood yelling for her, trying to locate her. Jaclyn alerted social media and the fabulous people of Pittsburgh all emerged from their homes and we had a search committee comparable to one you would expect for a missing toddler. The whole neighborhood was on high alert and as I drove my jeep around the neighborhood, I passed a dozen people with flashlights calling for her. I thanked them all and kept pushing forward. Eventually, in a dark far corner of the neighborhood, I saw a creature that looked like Rosie run in front of my car and into the driveway. I stopped the car and looked at the animal and said, “Rosie, is that you?” The creature was roughly the same size and shape as Rosie, but looked a little different. “ROSIE! Come here Rosie!” The creature stared back at me and frozen in indecision. I open the car door and step closer, at this point, I realize it is a possum and it runs like hell to get away from me. You can say a lot about Pittsburgh, but in my experience, the people are remarkably compassionate and everything you would want in a community. Good, great, wonderful people helped us in locating our dog on a cold February night. Rosie eventually appeared, she was somehow locked in our garage, but it took us hours of searching 3 square miles to figure it out. Enjoyed the Super Bowl on Sunday night. We had a ton of food in the freezer from past parties and we decided to thaw it out and put together an amazing spread (by “we”, I mean my amazing wife Jaclyn). I ate for about 45 minutes straight until I was super full, then I proceeded to eat another 4 lbs of food. I believe there is only a couple chromosomes that separate me from my gluttonous black lab who drools and begs for unlimited food and could easily consume until sickness overtakes us. Well, it is a good night, we are all united again and under the same warm roof. Snow will be upon us tonight and temps fall into single digits this week. May yinz all stay warm! We had a blissfully warm January weekend. In our town of McMurray, the snow from last week had long since melted and the green landscape beckoned a walk in the woods. The entire family was game, including Rosie (the dachshund) and Benny (the lab). We packed ourselves into the jeep and headed for Ohiopyle. In the summer, Ohiopyle is a mecca for granola outdoorsy folks who pile kayaks on top their cars, bath under waterfalls, and go romping along the natural water slides for recreation. When we arrived on this superb January weekend, we were suprised to find it desolate, blanketed in a foot of snow and many of the outfitters were closed for the season. There was a trail that I wanted to check out, it is called Baughman Trail and it starts in Ohiopyle and goes uphill for 3.5 miles until you get to an amazing vista. It is a challenging trail in any circumstance, but it would have killed my family as it was completely covered in deep fresh snow. We decided to take a much easier, flatter, and previously explored trail where the snow was flattened considerably. We took Ferncliff trail and it travels along a peninsula nestled within the Youghioheny River. The trail was perfect and offered many serene moments in the wintry landscape, there is something very meditative about hiking through the snow. Last year, I really stepped up my game in terms of hiking and outdoor exploration. I read a couple books on camping, hiking, and wilderness survival. I read an entire book on hiking in Western Pennsylvania and have explored many of the trails already. I camped for the first time since I was a kid. I got the gear to handle most situations. This year, I plan to raise my game and go further and longer. There are a couple campgrounds that you can only get to by boat (canoe/kayak), I hope to make that happen this year. One limitation is that my phone has been my primary navigational device and when I lost cell phone service, my Google Maps would not work. I have now resolved that issue with an amazing app called GAIA GPS. It has incredible topographical maps that you can download when you are connected to the internet, save them to your phone, and you can access them when you are off the grid. What’s even better is that the iPhone has a GPS function (does not require cell service to work) and shows your position, track/path on the downloaded map. Before I was worried about traveling deep into the woods because I was afraid I may get lost, I am no longer concerned with this technology. The big concern now is traveling deep into the woods, getting injured and dragging myself back. I sprained my ankle on a hike awhile back and it was pretty brutal realizing that you have to walk back 4 miles on a hobbled ankle. Lugging around water was also a challenge (I used to carry a giant growler type device) for long hikes. I now have a camelback backpack and is a significant improvement. All said, I am very excited about the year ahead! There is a great general store/restaurant on the main corner of Ohiopyle, we had worked up a healthy appetite from the hike and enjoyed soups and sandwiches, finished it off with ice cream. Kids are becoming very capable on the trails, we hiked about 3 miles and there was no need for anyone to be carried, no need for a rest stop, we plowed along and enjoyed the hike in the snow. Benny races through the snow, he races ahead and peeks around the bend to do reconnaissance, runs back to check on a lagging member of our party, runs back up front, eats snow, hops through the snow, loving every second. Rosie has a determination about her and runs just behind the leader at all times, it is amazing to watch her clear obstacles, such as a fallen tree. Today will be warm, but the freezing cold returns this weekend.